Project selected as one of 101 winning designs from top agencies. 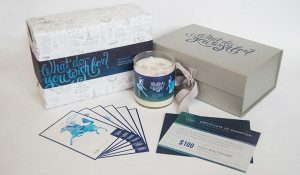 [Cincinnati]—Make-A- Wish Gift, a project developed by Eleven Peppers Studios, was chosen as a Merit winner in the most recent HOW Promotion & Marketing Design Awards. This highly selective and well-regarded competition sponsored by HOW magazine recognizes outstanding creative work produced by individuals and creative agencies from around the world. HOW’s editorial and design team, along with Breakaway’s Chief Creative Officer Scott Maney, Designlore’s Laurie Churchman, and The Davis Group’s Principal Douglas Davis, evaluated nearly 1,000 entries and selected winning projects that demonstrated an ideal mix of concept, strategy and execution. Entries were judged by type of work (e.g., Designer Promotions, Client Promotions, Personal Promotions) and also by how effectively the design achieved the stated business goals. Every year the Eleven Peppers Studios team sends a holiday gift in December to say thank you to their clients, mentors and supporters. In 2015, they decided that their gift would be individual donations made to the Make-A- Wish Foundation in the names of their clients, supporters and mentors. To commemorate the donation, they wanted to reinforce the beauty of wishing, and collaborated with a local vendor to create hand-poured soy candles. The candles were specially designed to have three wicks, each wick symbolizing a word in the Make-A- Wish Foundation mission statement—hope, strength and joy. The overall theme is celestial, and the candle wrap features hand-drawn illustrations of the wishes of actual Make-A- Wish children, rotating around the candle. As a hidden surprise, the illustrations have been punched with tiny holes that reveal constellations when the candle is illuminated. To check out the full project page o f our Make-A-Wish Gift, please click here. To see the official press release, please click here. All Merit winners will be featured in the Fall 2016 issue of HOW magazine and will be spotlighted on HOWdesign.com. And as Promotion Design Award winners, the Eleven Peppers Studios creative team receives a $100 gift certificate toward registration for HOW Design Live 2017. Please visit HOWDesignLive.com for event details. HOW will be accepting entries for next year’s Promotion Design Awards; information is available at HOWdesign.com/design-competitions/promotion- design-awards. Founded in 1985, the HOW brand began its life as a print magazine. Today, the brand still includes an award-winning design magazine, but has grown to encompass a host of products and events including several design competitions, HOW U’s online design courses, design books (available at MyDesignShop.com) and more. Whether you work for a design firm, for an in-house creative department or for yourself, it’s our mission to serve the business, creativity and technology needs of graphic designers. Woman-owned small business specializing in print, web and interactive design.